Now that it is November and Thanksgiving is on its way, Christmas and Hanukkah are not far behind. I have already seen Christmas decor in stores and it seems like it is out earlier every year. Putting aside the commercialism of the holiday season, it is really a great time of the year to see family and celebrate another year together. The best way to celebrate is with a holiday party! I know a lot of companies are cutting out holiday parties last year and probably this year but there are fun and inexpensive ways to get your jingle bell on without going bankrupt. Or having a holiday party for your friends at your house. One of the best and most fun ideas is to have a "secret Santa" or "white elephant" where each participant secretly chooses another person's name out of a hat and then the only person getting a gift for the name chosen. It is never too early to plan, so I am posting some tips and inspiration. Tip #1- Definitely send out invitations and send them out as early as you can. Facebook invites or text messages are nice to give people a heads up but having something to remind your guests of the date every time they head for the fridge is ideal. Plus, the holidays are a busy time and people's availability often books up pretty quickly. You can purchase invites online this the one posted below OR you can get creative and make your own. I have used Microsoft Publisher the past couple of years for invites and holiday cards. The only cost is printing that you can do at home or go to local printing shop. Color printing is usually priced according to amount of pages, so make sure to ask that your invites are printed 4 to a page. Tip #2- Whether at work or at home, the food should be easy and appealing to a wide variety of tastes. A great idea for work is pot luck but make a list of what everyone is committing to bringing to ensure success. There should also be someone assigned to drinks, plates, cups, plasticware, etc if it is not already in your office. No point in Sue bringing her famous Swedish Meatballs if there are no plates. For a home party, keep it simple. The time and location sets the formality for events and if you opt for a later start time, you do not have to feed your guests a full meal. Light finger food are the best for house parties and dessert buffets are always a hit. Don't forget a fully stocked bar and the same goes for having enough cups, plates, etc! Tip #3- Always pay attention to the small details, great decor is something everyone will notice and remember. This is universal to all parties. You can't expect guests to get into the holiday spirit without any decorations! I love this first image of place seatings with apples. If this is too formal, you can do what I did last year- I bought and used different colored reindeer wine charms for my guests to use for the hot spiced cider. Or you can buy wine charms and give them as a gift to each guest. And if you do have red solo cups for mixed drinks, make sure you have a sharpie handy for labeling. An unexpected touch is to keep red & green food dye handy to add a festive kick to clear drinks. Not that you have to spend a lot of money on decor- take advantage of what you already have! Using your own ornaments in a clear vase, filling candy bowls with the bright holiday candy or using cranberries to fill in around candles is a easy way to add decor in any room. And don't get me started on a crazy holiday sweater theme- you don't need to give me an excuse to play dress up. For an office party, in addition to traditional holiday decor, I suggest asking people to bring in baby pictures of themselves during the holidays (who doesn't have at least one picture with Santa at the mall?) and create a board for coworkers to guess who is who. The winner gets a prize, maybe some wine charms! (That idea could easily work for a house party as well.) Another idea is to split the office into teams and have a gingerbread decorating contest. The point is to keep it fun for everyone and to not feel like its another day at work. I hope this has given you some ideas for the fast-approaching holiday season. Enjoy! *The title of the post is a classic American holiday movie reference (Source). 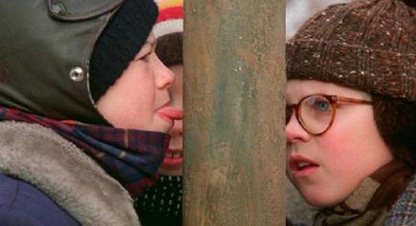 "The Christmas Story" is pretty much perfection and if you haven't seen it, get it on your Netflix queue ASAP!